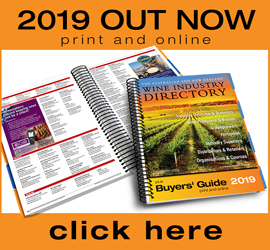 With two recent detections of brown marmorated stink bug (BMSB) in Victoria in spite of heightened biosecurity measures introduced last year to keep it out of Australia, the following article by Wine Australia’s Liz Waters, published in the just-released Summer ’19 issue of the Wine & Viticulture Journal, is a handy overview of the pest and underlines the importance of keeping a watch out for it. 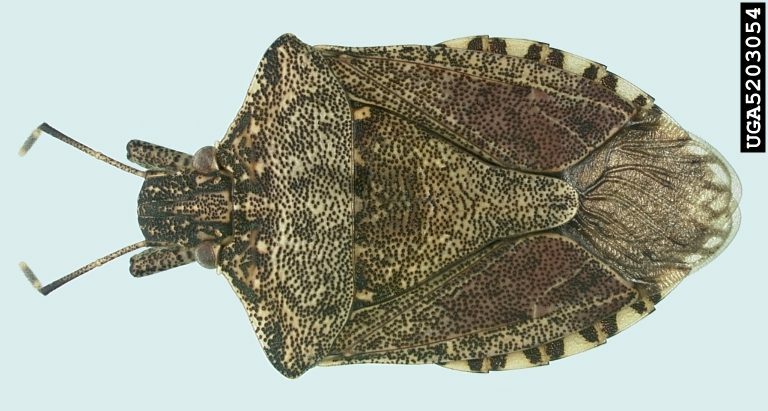 The brown marmorated stink bug (Halyomorpha halys) may only be around 12-17mm long but it has Australia’s biosecurity agencies worried – and with good reason. After a couple of the critters tried to slip into the country in 2018 by stowing away in shipping containers, strict new quarantine protocols have been put into place to reduce the risk of introducing them into the country. The mottled (marmorated being a fancy term for marbled or blotchy) brown, shield-shaped stink bug is originally from eastern Asia but was recently introduced to North America and Europe where it is having a significant impact on agriculture and horticulture and becoming a major pest in homes and other buildings, where it seeks shelter over winter. The stink bug is a versatile pest, attacking a wide range of species from apples to plums to vines (a list of species affected – both ornamental and agricultural – can be found at www.stopbmsb.org/where-is-bmsb/ host-plants. 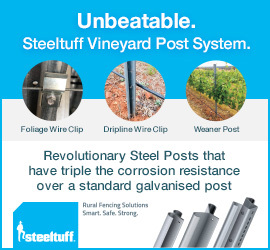 It can be a particular menace in vineyards where even low numbers – three or so per bunch – can cause physical damage to berries making them much more susceptible to bunch rot and, hence, yield loss. Just as significantly, the stink bugs’ characteristic unpleasant odour, released when stressed or threatened, can cause wine taints should they end up in numbers in ferments. Work undertaken by Dr Elizabeth Tomasino’s group at Oregon State University has shown that odours released by stink bugs cause strong aromas described as ‘green’ and ‘coriander-like’ in wine. As few as three stink bugs per bunch was enough for consumers to reject wine. 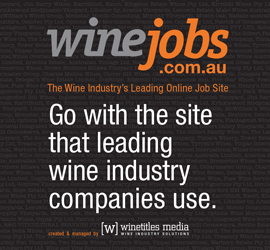 Conventional fining treatments are incapable of removing the odours from wine. The Department of Agriculture and Water Resources is requiring targeted, high-risk cargo (such as motor vehicles, heavy machinery and oak imports) from high-risk countries (including France, Georgia, Germany, Greece, Hungary, Italy, Romania, Russia and the USA) to be treated through an approved treatment provider. The Department has acknowledged that these protocols could result in delays in goods arriving in Australia due to the treatment and clearance requirements. Vinehealth Australia is encouraging grapegrowers and winemakers to look out for pests whenever unpacking containers or receiving international goods. If unusual pests are spotted, secure the goods to limit the movements of the pests and immediately report it to the exotic Plant Pest Hotline on 1800 084 881. The brown marmorated stink bug looks similar to many Australian native stink bugs. However, it has distinctive black and white banding around the outer edge of the abdomen, and white bands on the last two segments of its antennae. The Department has produced a field guide to assist in the identification of the pest which can be accessed at: www. agriculture.gov.au/pests-diseases-weeds/ plant/brown-marmorated-stink-bug. September through April are considered to be the highest risk months for the stink bugs to enter Australia. The pest has proved difficult to control in the USA and Europe as it can move from one food source to another fairly quickly, as it is capable of flying short distances. This means that chemical controls are not effective in the longer term as crops and orchards are soon reinfested from surrounding environs. All the more reason to stop the brown marmorated stink bug from getting into Australia.